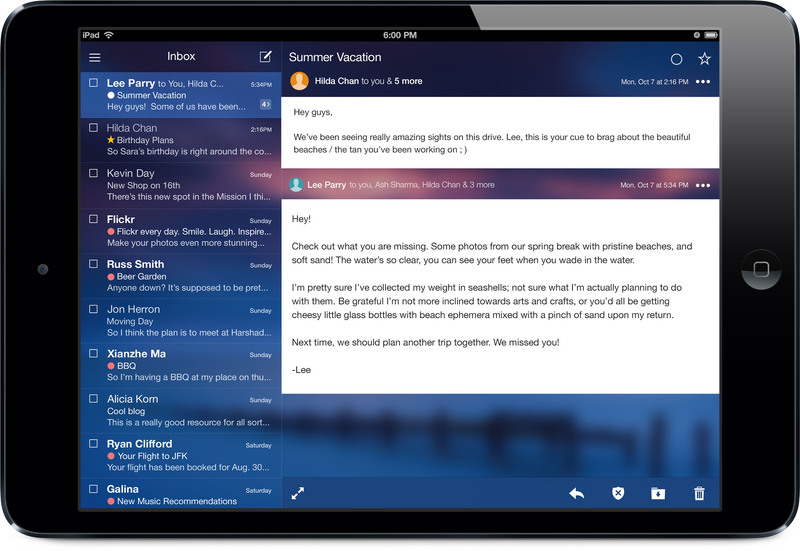 Yahoo is updating its Mail app across all platforms with a fresh design that includes syncing themes, a new compose experience, collapsible toolbar and better handling of threaded conversations. The new app is rolling out across the web, Android, iOS and Windows 8 devices beginning today, with nearly complete feature parity between all versions. The update brings a radical new look to the inbox, largely due to the new themes which use either solid colors, provided images or content from Flickr. 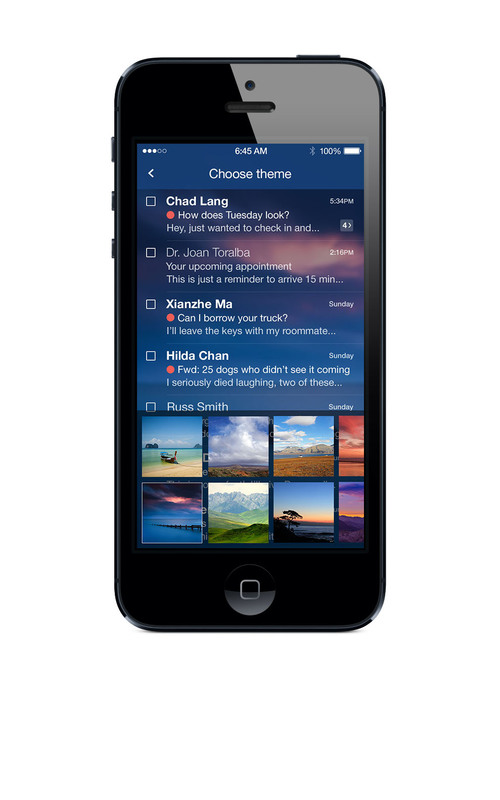 If the look of the themes feels familiar, it might be because you’ve seen Yahoo’s Apple Design Award-winning Weather app for iOS. The new appearance of Mail owes a lot to that app and, when you take it in aggregate, looks a lot like Apple’s iOS 7. There are lots of transparency effects going on here, on iOS 7 there is even some parallax effects that Jeff Bonforte, VP of Communications, says adds some readability and context. There are also some business aspects of Yahoo Mail that are changing with this update, says Bonforte. First of all, Yahoo is bumping the storage limit for Mail to 1TB for all users. That should provide around 500k-1M attachments and ‘6,000 years’ of inbox for the average user, says Yahoo. 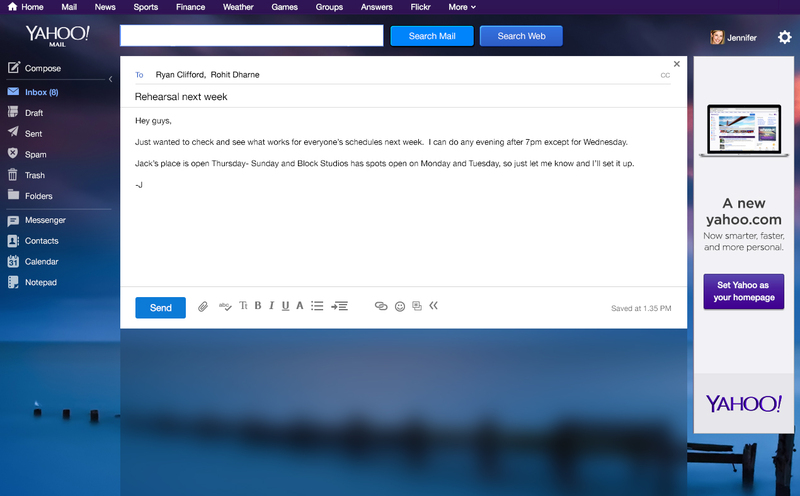 All of the features that were previously a part of Yahoo’s ‘Mail Plus’ product are also now free for all users. This means that things like disposable email addresses, POP email and mail forwarding are all included with a basic Yahoo Mail account. Users who have previously subscribed to Mail Plus are grandfathered in and will be able to continue paying $19.99 a year for the ‘ad free’ version of mail, but new users who want a ‘no ads’ Yahoo Mail will have to pay $49.99 a year for the new Ad-Free Mail product. Still, if you’re ok with some ads, the new Mail gets a lot of new functionality for nada. When Yahoo Mail users load up the new look they’re going to be in for a nice treat. The new design is cleaner and crisper, while not totally breaking the fundamentals of how the product works. By default, it looks like a nice update, but applying a theme really brings it alive. Those themes, says David McDowell, SVP of Product on Mail, will sync across all of your web and mobile versions of the app. Having those personalizations carry over should make sure that it still feels coherent when you bounce from one platform to another. 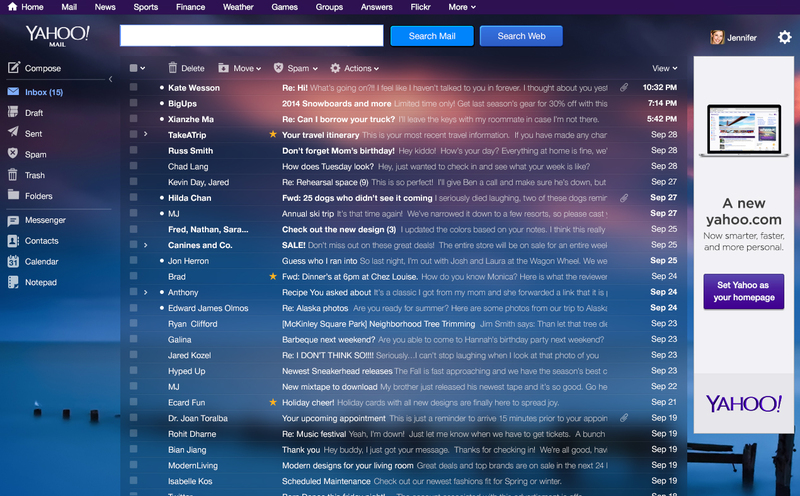 In addition to the visual changes, there have also been a series of mechanical updates to the Yahoo inbox. The sidebar along the left side of the screen on the web version is now collapsible, letting you give over more of your real-estate to message content. When you fold it down you’ll just get simple icons along the left. A few decisions have been made that should improve your speed and mail handling, says McDowell. One is a series of shortcuts that let you ‘star’, find email from the same sender or trash a message without having to actually open it up. Part of that speed improvement is a new expandable conversation thread that lets you see all of the messages you’ve traded with that person without having to ‘open’ the full view. Just click on a downward chevron to see a quick view of your messages. If you want the ‘whole shebang’, you can still click on the message proper to see everything that’s been said. This is a neat hybrid of the way that conversations work on tablets and how they work in Gmail currently. One less click into the hierarchy just to see the last few messages is time saved, so that’s nice. There is also a nice update to the compose mechanics both inside and out of conversations. One-click replies at the bottom of threads let you dash off a reply very quickly, bringing to mind an IM conversation, rather than a ‘heavy’ email convo. The single-serving ‘compose’ window is also much improved, with a cleaner and more logical layout. The formatting options have been moved to the bottom, away from the ‘to’ and subject fields, which lightens the cognitive load when you’re smashing out a receiver and a topic. The CC and BCC fields are also collapsed into the to field, which clears additional clutter. The subject line has been given a bit of precedence and bolder type to give it a ‘blog post’ type feel as well. All of these features are going to be coming to Yahoo’s apps for Windows 8, Android and iOS as well, says Lee Parry, Yahoo Senior Director of Mobile on Mail. In a demonstration of the tablet version, Parry noted that all of the shortcut options are accessible via a swipe on a message, and the threaded conversations work well as exposed in the secondary pane. The iPad version looks right at home on iOS 7, with translucency and a simplified design palette. The DNA of ‘Yahoo Weather’ is readily evident, as is how closely that design forecasted the direction Apple went with iOS 7. If you’re not a Yahoo Mail user, then you’ve probably got a fairly large library of mail keeping you locked into your current provider. But if you’re in the market for a new inbox, the new updates give Mail the best look it’s had in ages. And there are a bunch of little details here that show some serious thought about how email does and should work. I’d love to see some of the changes become standard fare in other inboxes. Yahoo’s new Mail service launched in 2012 and hasn’t seen a major update in about a year, so this is a milestone release. And it’s still one of the biggest providers out there with around 281M users. Yahoo has taken some heat lately on the mail front for its recycling policies, but it appears to have been taking those seriously. As we wrote, account recycling is something that all services will have to deal with at some point, so it’s worth exploring how to do it right. Questions still remain about how Yahoo will leverage its recent tear of talent acquisitions, but Mail itself is looking great. If this is any indication, the refreshes that we’re about to see for other Yahoo products should be pretty solid stuff.